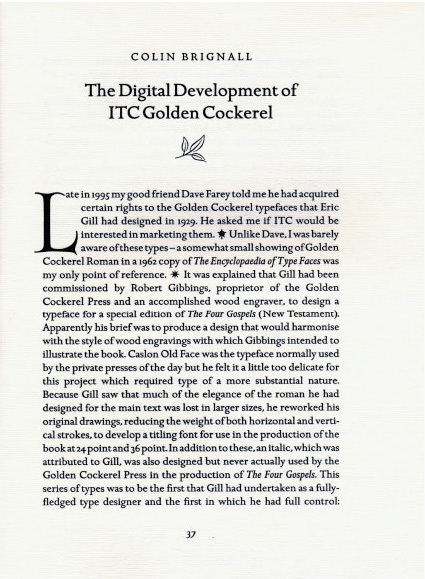 A single column treatment can confer a sense of authority and import, especially when enhanced with a striking drop cap and tasteful ornaments, as displayed in this keepsake detailing the development of the ITC Golden Cockerel ™ typefaces. When determining the number of columns to use, consider both the length of the copy and its role within the publication or piece. For brief settings, a single column can denote importance and attract attention, as with an introduction, dedication, or letter from the editor. Multiple columns are the best way to accommodate lengthy body copy. 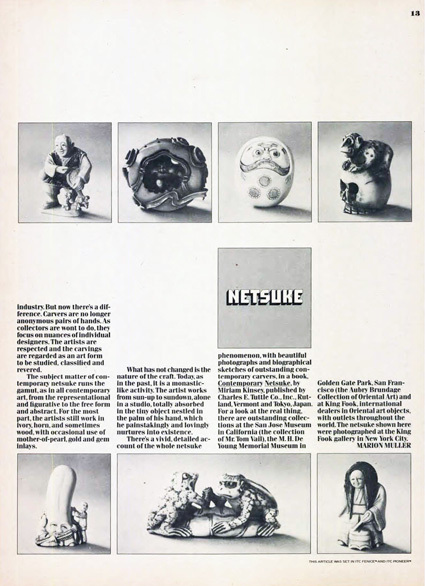 A multi-column format also provides a grid for the insertion of illustrations, photographs, pull quotes, and the like. A four-column grid can provide a flexible framework for both text and images. 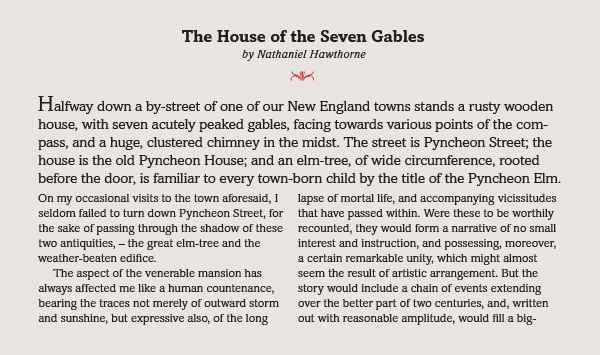 This layout is dynamic, inviting and balanced – and strengthened by the inclusion of white space above the headline. Excerpt from U&lc (Vol. 10, No. 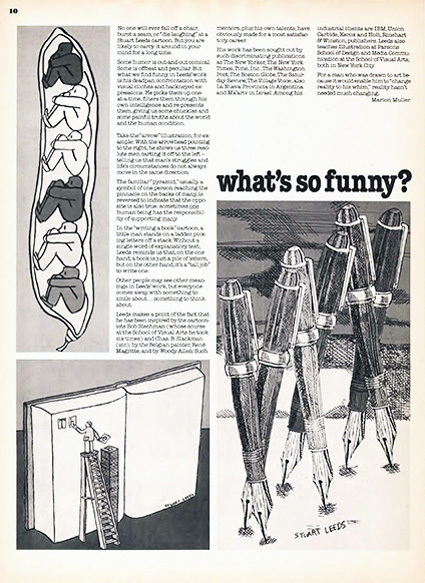 1, 1983), the typographic journal known for its expressive and groundbreaking use of type from the early 1970s until the turn of the millennium. A key factor in determining how many columns to use is the number of characters that will fit in a line. Bear in mind that a change of typeface and/or type size may well affect the number of characters per line. Additionally, setting a column width without considering the type that will flow into it can be risky. For example, if the text contains many multi-syllabic words (as in a scientific or technical piece) or frequent mention of long names, the columns will need to accommodate these without too many (and, in some instances, without any) hyphenations. This four-column treatment is made all the more energetic and interesting by staggering the tops of the columns, and aligning them on the bottom. U&lc (Vol. 9, No. 1, 1982). Generally speaking, a line length between 65 and 80 characters is considered optimal in terms of readability. Very narrow columns (less than 35 or 40 characters per line) can lead to an over-abundance of hyphenated words and/or excessively ragged line breaks. At the other extreme, be wary of a multitude of long lines (100 characters or more). Either scenario can result in reduced readability, potentially losing the reader’s attention and interest. Taking your columnar layout for a trial run with actual text at the beginning of a project is a good typographic habit. (Top) The one-column treatment is tasteful and readable when justified, thanks partly to the generous 95 characters per line. (Middle) The three-column grid begins to deteriorate, typographically speaking, due to short lines (approx. 28 characters per line) being ‘forced’ to justify. (Bottom) This setting borders on unreadable when set either justified or flush left, because of the extremely narrow column (approx. 17 characters per line). There is no way to avoid excessive word and letter spacing in justified text, or exceedingly deep rags in flush left text. Both of these options greatly disrupt readability. Most multi-column formats, such as newspapers, magazines, and brochures, use top alignment to provide a clean, consistent entry point for the reader. Allowing for a full line space before subheads and other copy breaks ensures that text aligns horizontally across columns. Line-to-line symmetry is visually pleasing, whereas lines that seem out of kilter are jarring. Column bottoms can either align perfectly (as they do in most newspapers and magazines), or be clearly staggered. Intentional staggering can add white space and create visual interest. Whichever treatment you choose, make it a deliberate, purposeful design decision. Other variables that are sometimes overlooked when setting up columns concern spacing along their vertical edges. The space between columns is referred to as the gutter, and the space between the outer columns and the edges of the page is called the margin. Gutters should be narrow enough to keep the columns visually flowing, and connected as a unit. 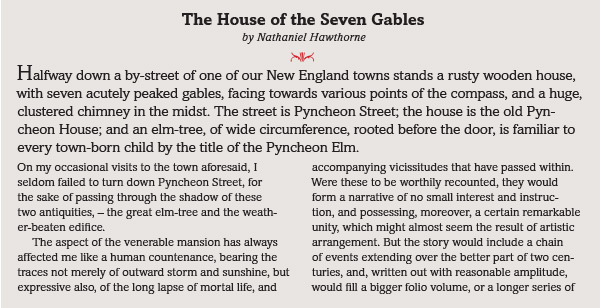 All margins should be generous enough to provide adequate white space so that the columns and other elements on the page don’t appear cramped. A potentially attractive one-to-two column grid can miss the boat miserably when the margins are too narrow and the gutter too wide – both of which contribute to an unbalanced layout. 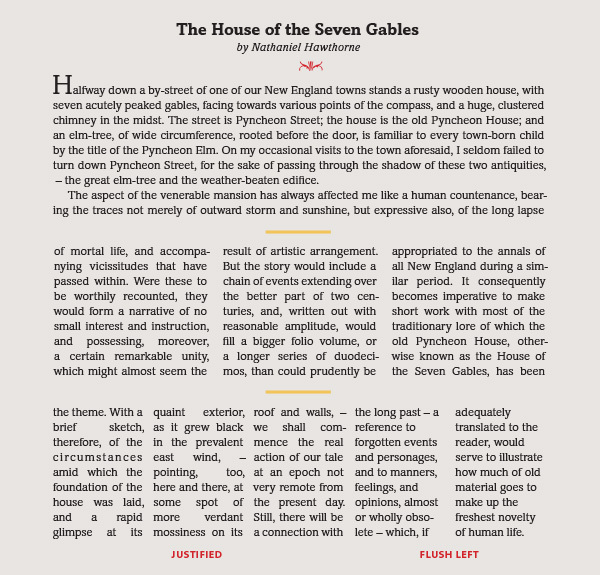 The same layout is greatly improved by increasing the margins and narrowing the gutter so that it is in proportion to the text settings it divides. Taking the time at the onset of a project to carefully make all these decisions will contribute to developing a design that is typographically sound, and therefore pleasing and readable.